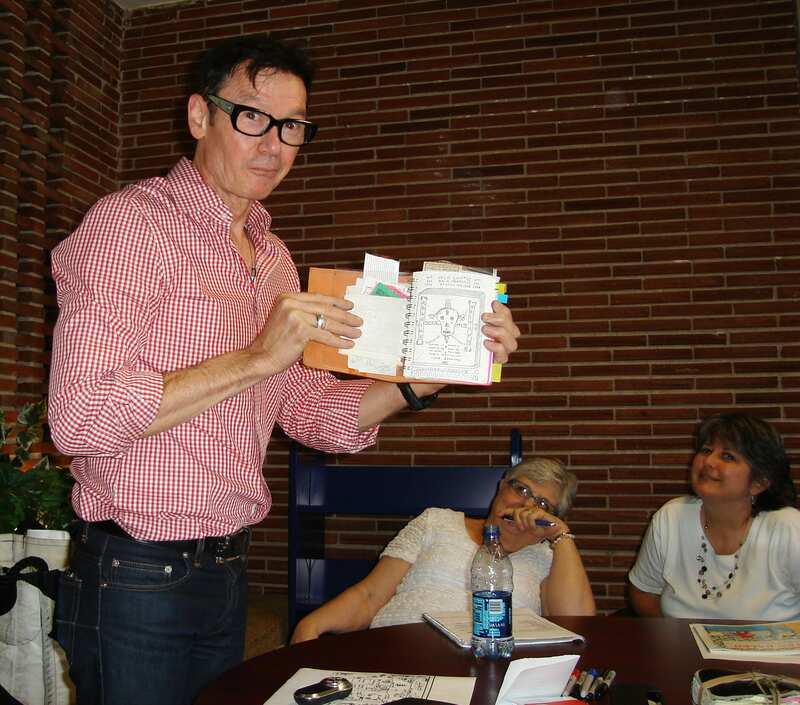 Author Jack Gantos shows his notebook filled with story ideas to a group of Northwest Arkansas teachers during a previous visit to Fayetteville. The University of Arkansas Clinic for Literacy will bring back Jack Gantos, an award-winning children’s author, for this fall’s literacy camp. Parents can go online to enroll children in grades kindergarten through sixth. Registration is $49.99 per child. Gantos has written books for readers of all ages, from picture books and middle-grade fiction to novels for young adults and adults. His works include Hole in My Life, a memoir that won the Michael L. Printz and Robert F. Sibert honors; Joey Pigza Swallowed the Key, a National Book Award Finalist, Joey Pigza Loses Control, a Newbery Honor book, and Dead End in Norvelt, the 2012 Newbery Medal Winner and the Scott O’Dell Award Winner for Best Historic Fiction. He spoke to participants of the literacy symposium presented by the College of Education and Health Professions in 2013. The fall literacy camp will focus on Gantos and his works and include a visit by the author on Sept. 8. It will take place from 9 to 11 a.m. on four Saturdays — Sept. 8, Sept. 29, Oct. 13 and Nov. 3 — in Peabody Hall. Attendance is required for all dates. The camp will help children develop their reading and writing skills, as well as enhance motivation to read and write. Participants will work with U of A teacher-education students in small group settings to learn about Gantos through an author study and then learning activities using his books. The university students who provide intervention for the children understand the science of reading and the various difficulties children face in learning to read. The goal is to teach children strategies that align with what they are already learning in school and that can be transferred to other areas of achievement. Linda Eilers, clinical associate professor of childhood education, and Heather Young, assistant professor who coordinates the childhood and elementary education programs, established the Clinic for Literacy in Peabody Hall in 2016.